“What do you think Nachila is feeling right at this moment?” asks Dr. Bethany Nelson to a room full of history students at Southeastern Regional Vocational Technical High School in South Easton, Massachusetts. “She’s thinking, ‘I’m ready to die,” shouts one student. “I’m not afraid of you,” shouts another. Multiple students enthusiastically chime in to participate. Nachila Ortiz is one of five high school students standing in front of the room, reenacting a photograph that is projected over their bodies. Three of the students pose, channeling the emotions in the faces of Jewish partisans captured by the Nazis during the Warsaw Ghetto Uprising. Two others pose as the Nazi officers; one pointing an imaginary rifle. 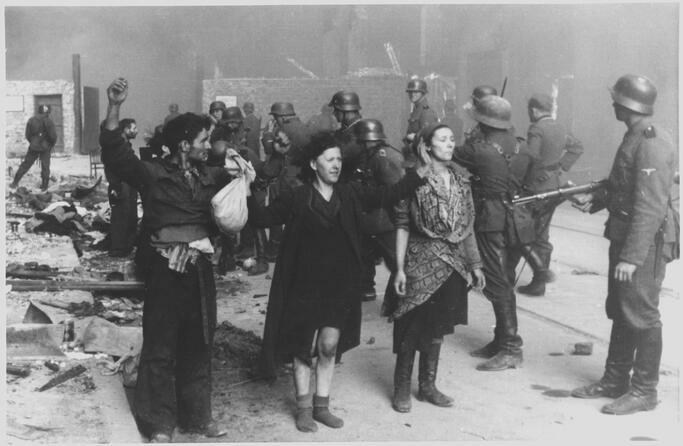 The photo of Jewish partisans captured during the Warsaw Ghetto Uprising that students reenacted. 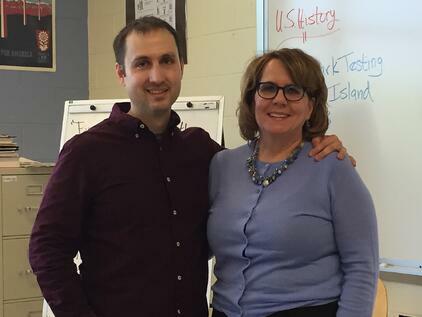 Dr. Nelson, a theatre professor at Emerson College in Boston, is visiting the class for a week, thanks to a 2015 Margot Stern Strom (MSS) Innovation Grant. She is helping students create a theatrical performance to preserve stories of Holocaust survivors. By using exercises like photo projection, students can “find the moment” so they can put themselves in the shoes of others, fostering empathy and understanding. But their performance is also part of something bigger. It’s part of the Holocaust Memory Project, which focuses on helping students learn history through different mediums while playing to their strengths in their vocational areas. That’s the kind of innovation Facing History’s Innovation Grants seek to promote. They allow educators to deepen their work with Facing History, and to use our content in new and inventive ways to solve problems, address important issues, and inspire their students to make a difference. History teachers Amy McLaughlin-Hatch and James Fernandez teamed up to create the project, which won them a 2015 MSS Innovation Grant. The two Facing History teachers are collaborating to combine research, history, theater, and documentary filmmaking to show students the importance of preserving memory, stories, and history so they can understand how their own choices can impact others around them. For Fernandes, it was through theater. His goal is to put his students in other people’s experiences so they can question how their own stories fit into the world and how they can shape the future. And it’s working. Students are applying the lessons of the past to their surroundings as they try to understand each other. They feel the class is bringing them closer together. McLaughlin-Hatch is using a different approach through research and filmmaking. After traveling to see historical Holocaust sites throughout Europe, she wanted to share her experiences with students beyond just a slideshow of pictures. Using her photos and videos, her class researched the sites she visited and then supplied the video production students with material to create a documentary film. It’s giving students like Bailey Redmond, a senior, a chance to apply his skills in video production while considering the human aspects of history. Bailey and his classmates are getting ready for their performance and film debuts this week as they close out their senior year. 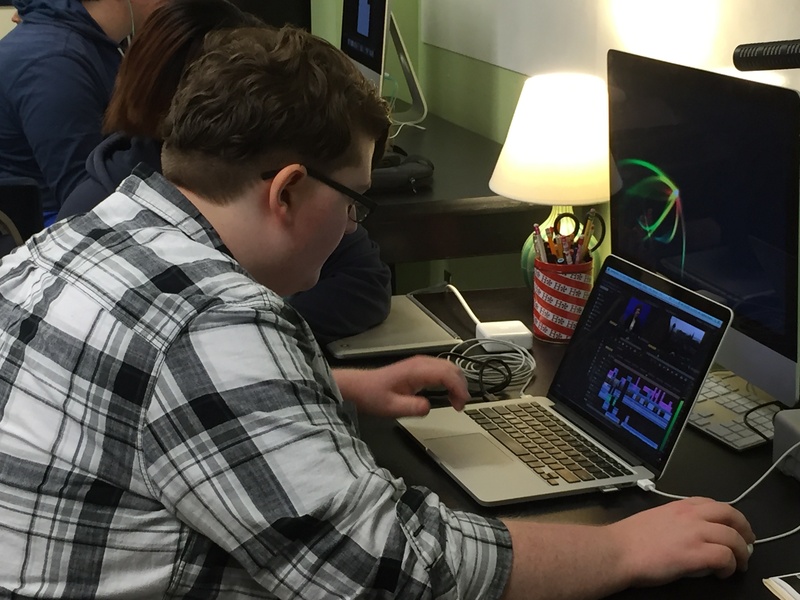 Bailey Redmond editing video footage for the documentary film. Based on their enthusiasm for the Holocaust Memory Project, these Southeastern seniors will be ready to launch into their future knowing they’re equipped to make positive choices in the years ahead. Read more about all of the 2015 Margot Stern Strom Innovation Grant winners!